1 Lecture 3 Pipeline Contd. (Appendix A) Instructor: L.N. 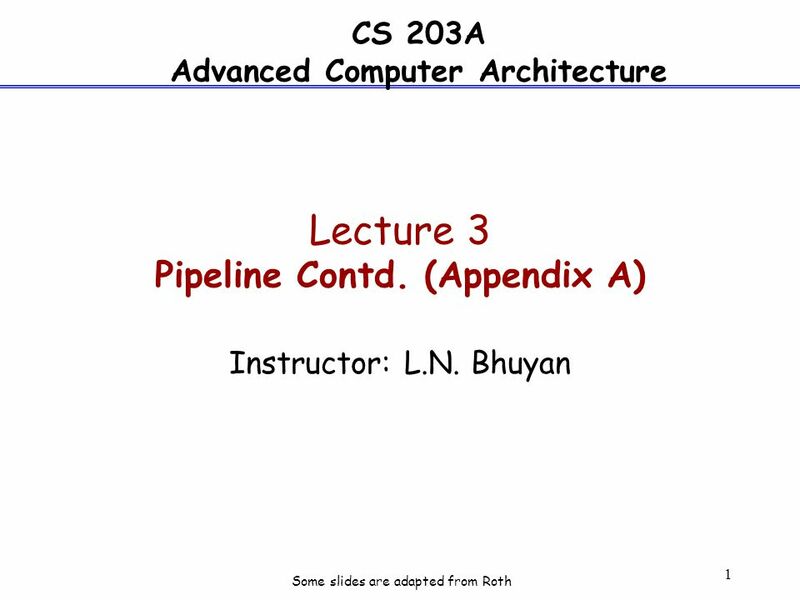 Bhuyan CS 203A Advanced Computer Architecture Some slides are adapted from Roth. 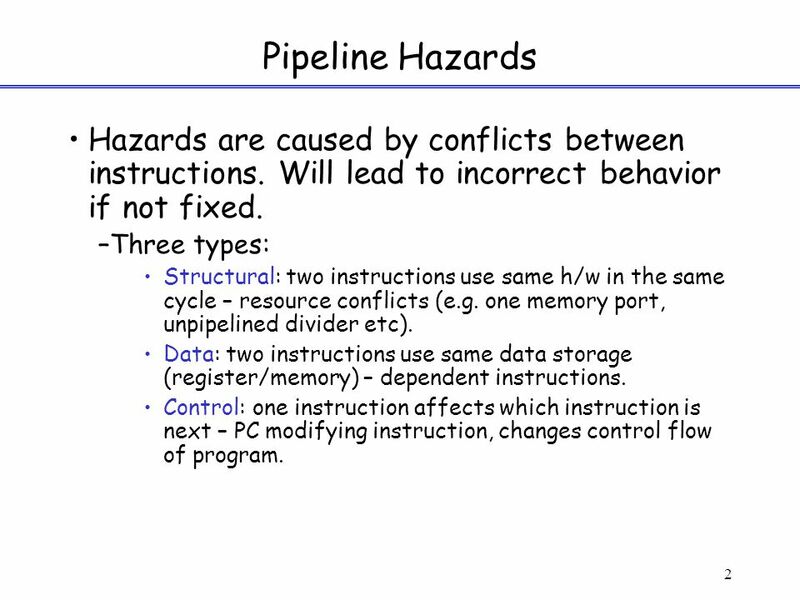 2 2 Pipeline Hazards Hazards are caused by conflicts between instructions. Will lead to incorrect behavior if not fixed. 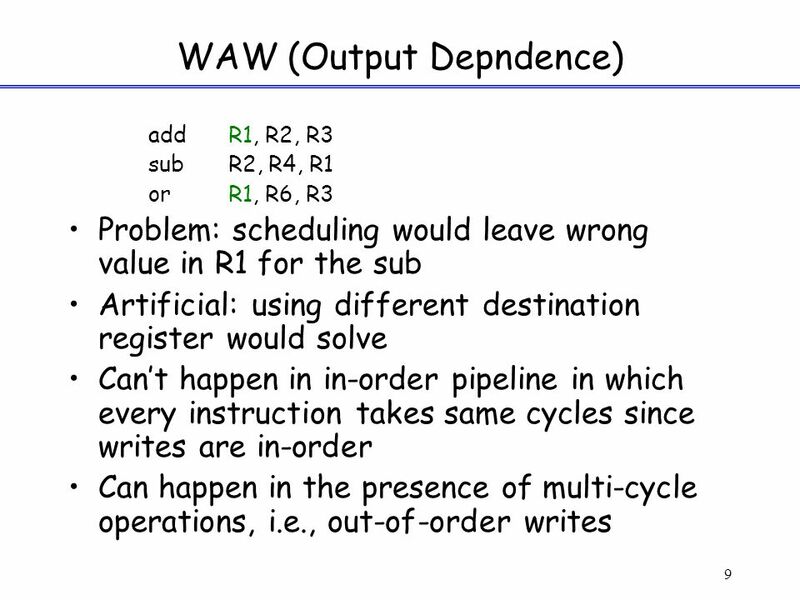 –Three types: Structural: two instructions use same h/w in the same cycle – resource conflicts (e.g. one memory port, unpipelined divider etc). 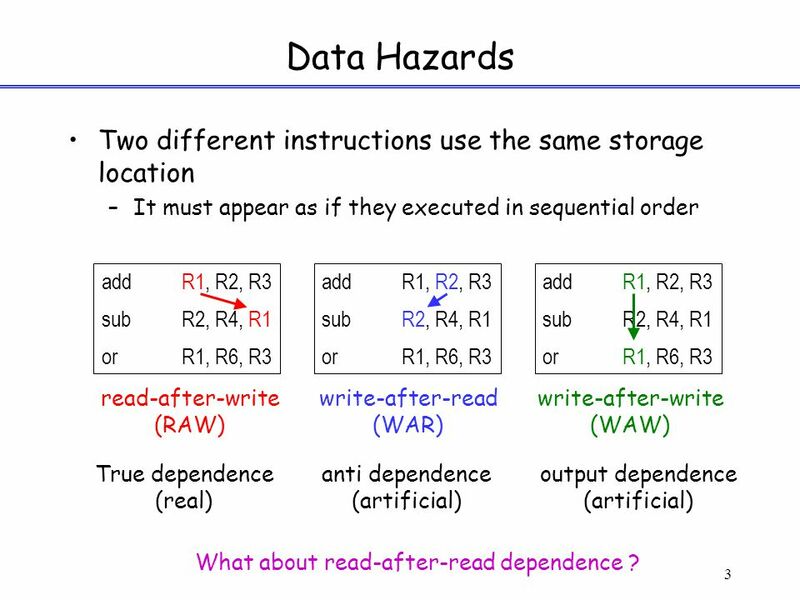 Data: two instructions use same data storage (register/memory) – dependent instructions. Control: one instruction affects which instruction is next – PC modifying instruction, changes control flow of program. 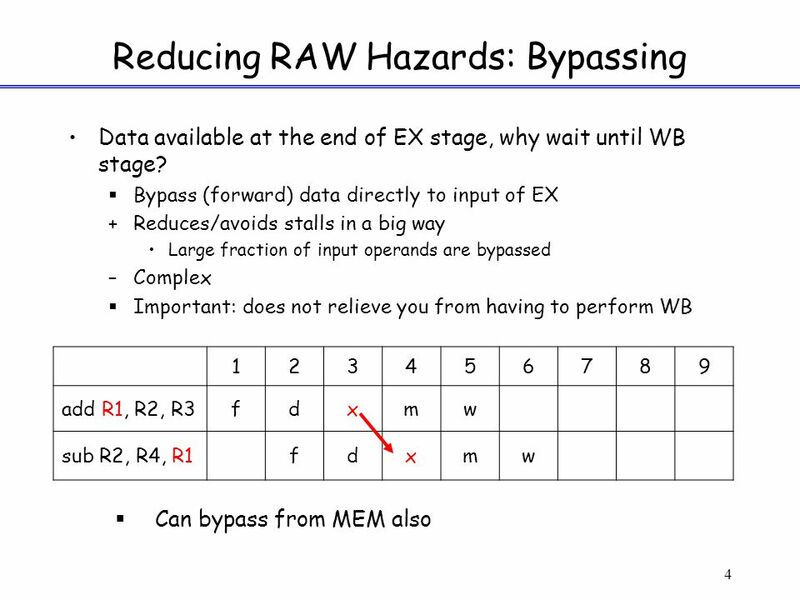 3 3 Data Hazards Two different instructions use the same storage location –It must appear as if they executed in sequential order addR1, R2, R3 subR2, R4, R1 orR1, R6, R3 addR1, R2, R3 subR2, R4, R1 orR1, R6, R3 addR1, R2, R3 subR2, R4, R1 orR1, R6, R3 read-after-write (RAW) write-after-read (WAR) write-after-write (WAW) True dependence (real) anti dependence (artificial) output dependence (artificial) What about read-after-read dependence ? 12 12 Control Hazards Branch problem: –branches are resolved in EX stage  2 cycles penalty on taken branches Ideal CPI =1. Assuming 2 cycles for all branches and 32% branch instructions  new CPI = 1 + 0.32*2 = 1.64 Solutions: –Reduce branch penalty: change the datapath – new adder needed in ID stage. –Fill branch delay slot(s) with a useful instruction. –Fixed branch prediction. –Static branch prediction. –Dynamic branch prediction. 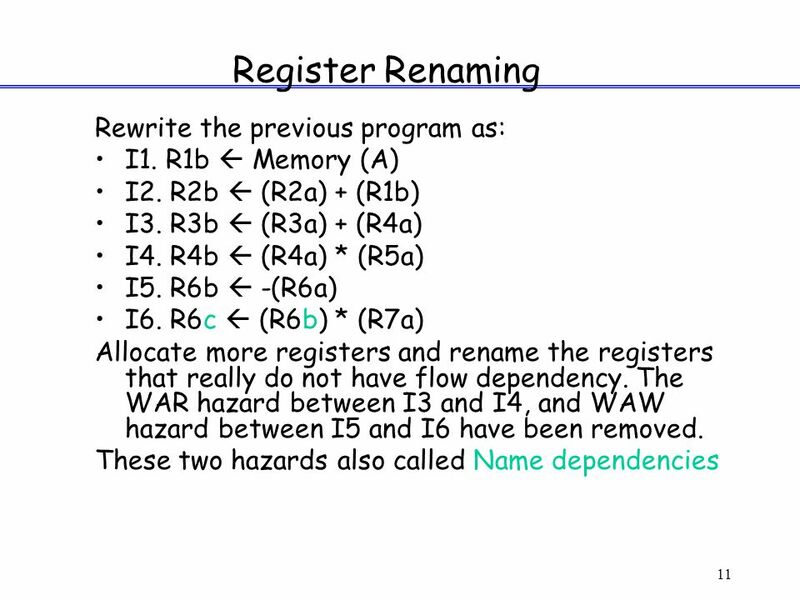 13 13 Control Hazards – branch delay slots Reduced branch penalty: –Compute condition and target address in the ID stage: 1 cycle stall. –Target and condition computed even when instruction is not a branch. 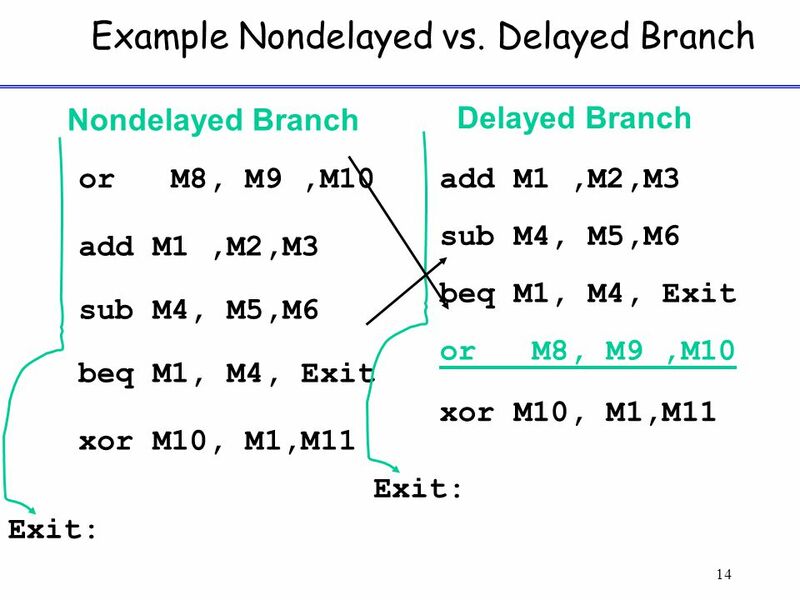 Branch delay slot filling: move an instruction into the slot right after the branch, hoping that its execution is necessary. 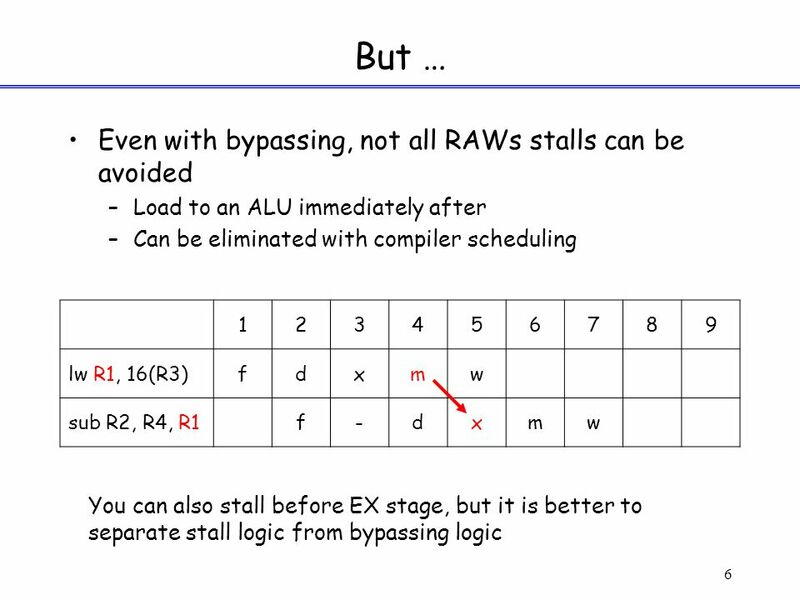 Three alternatives (next slide) Limitations: restrictions on which instructions can be rescheduled, compile time prediction of taken or untaken branches. 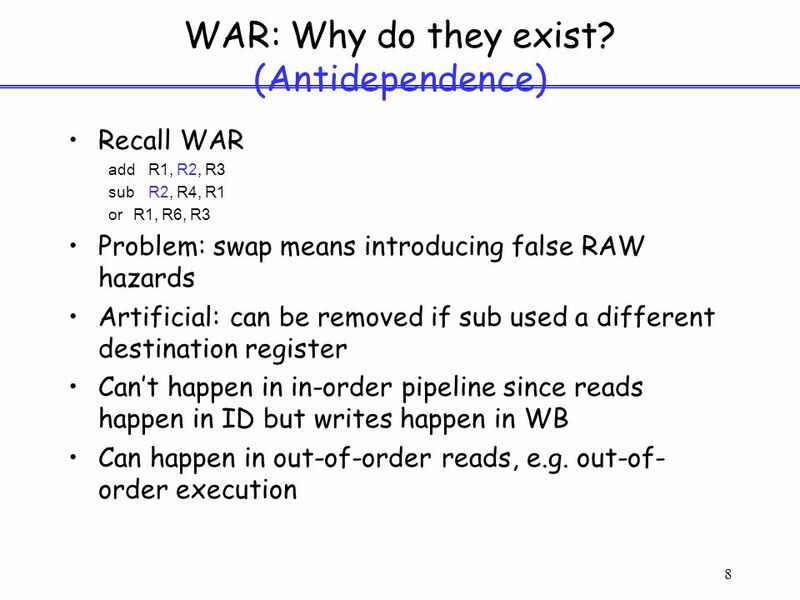 15 15 Control Hazards: Branch Prediction Idea: doing something is better than waiting around doing nothing oGuess branch target, start executing at guessed position oExecute branch, verify (check) your guess +minimize penalty if guess is right (to zero) –May increase penalty for wrong guesses oHeavily researched area in the last 15 years Fixed branch prediction. Each of these strategies must be applied to all branch instructions indiscriminately. –Predict not-taken (47% actually not taken): continue to fetch instruction without stalling; do not change any state (no register write); if branch is taken turn the fetched instruction into no-op, restart fetch at target address: 1 cycle penalty. 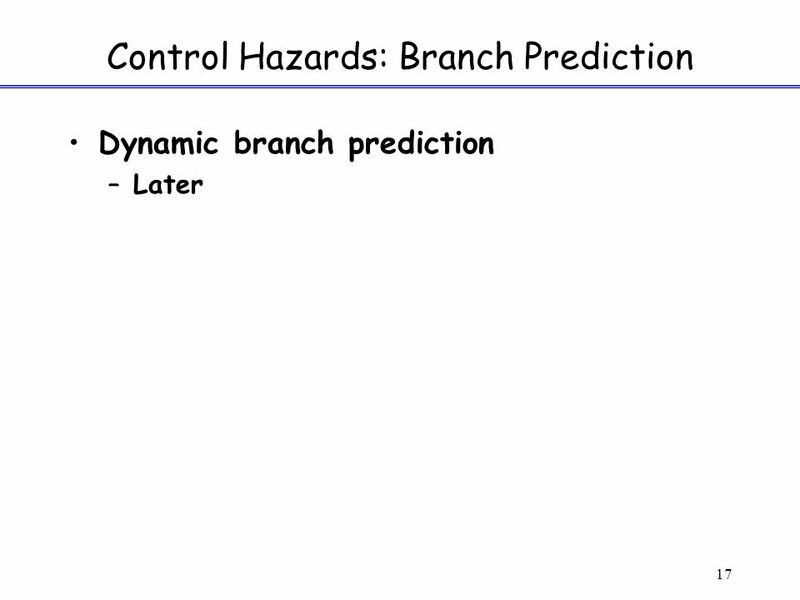 16 16 Control Hazards: Branch Prediction –Predict taken (53%): more difficult, must know target before branch is decoded. no advantage in our simple 5- stage pipeline. Static branch prediction. –Opcode-based: prediction based on opcode itself and related condition. Examples: MC 88110, PowerPC 601/603. –Displacement based prediction: if d = 0 predict not taken. Examples: Alpha 21064 (as option), PowerPC 601/603 for regular conditional branches. 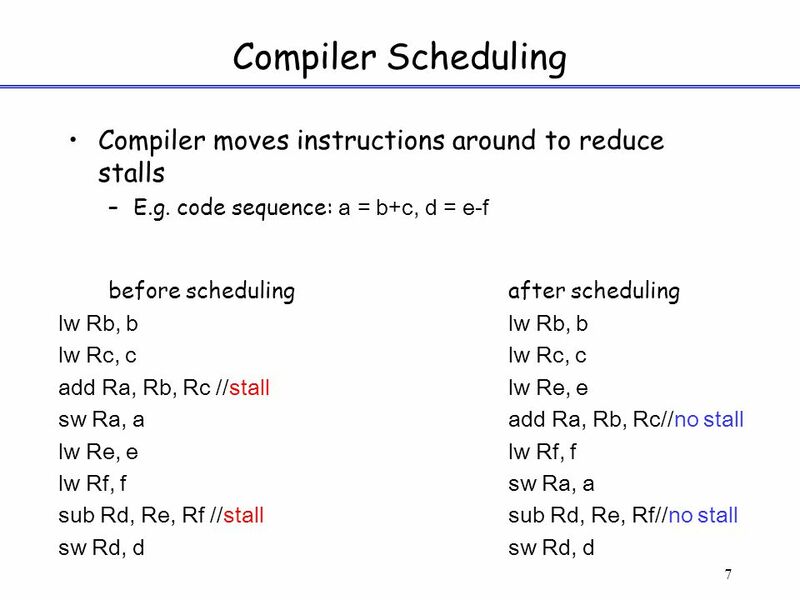 –Compiler-directed prediction: compiler sets or clears a predict bit in the instruction itself. Examples: AT&T 9210 Hobbit, PowerPC 601/603 (predict bit reverses opcode or displacement predictions), HP PA 8000 (as option). 21 Oct. 26, 200421 FP Loop: Where are the Hazards? Loop:LDF0,0(R1);F0=vector element ADDDF4,F0,F2;add scalar from F2 SD0(R1),F4;store result SUBIR1,R1,8;decrement pointer 8B (DW) BNEZR1,Loop;branch R1!=zero NOP;delayed branch slot InstructionInstructionLatency in producing resultusing result clock cycles FP ALU opAnother FP ALU op3 FP ALU opStore double2 Load doubleFP ALU op1 Load doubleStore double0 Integer opInteger op0 Where are the stalls? Download ppt "1 Lecture 3 Pipeline Contd. (Appendix A) Instructor: L.N. 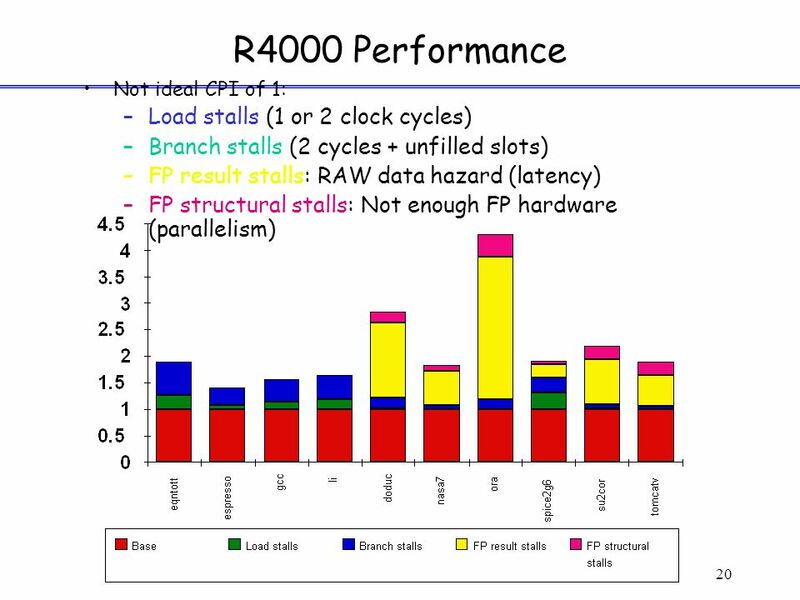 Bhuyan CS 203A Advanced Computer Architecture Some slides are adapted from Roth." ILP: IntroductionCSCE430/830 Instruction-level parallelism: Introduction CSCE430/830 Computer Architecture Lecturer: Prof. Hong Jiang Courtesy of Yifeng. 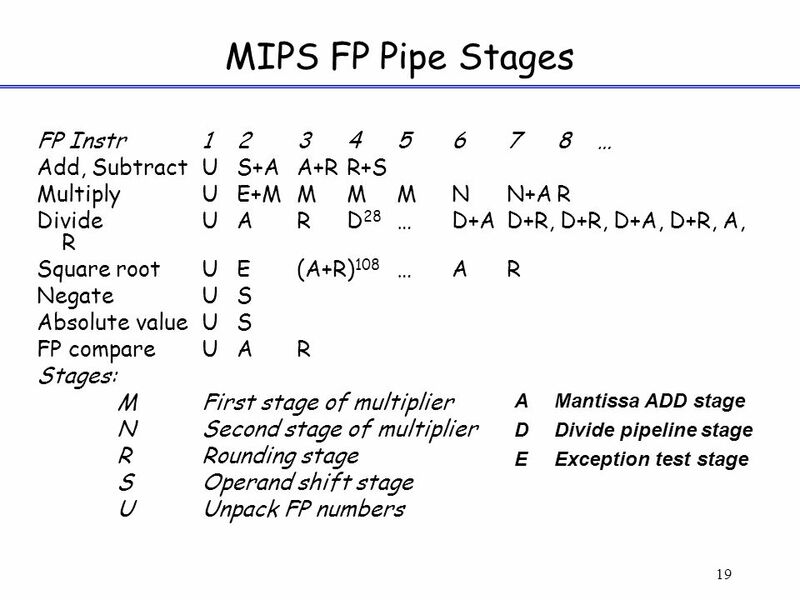 COMP381 by M. Hamdi 1 (Recap) Pipeline Hazards. COMP381 by M. Hamdi 2 I n s t r. O r d e r add r1,r2,r3 sub r4,r1,r3 and r6,r1,r7 or r8,r1,r9 xor r10,r1,r11. 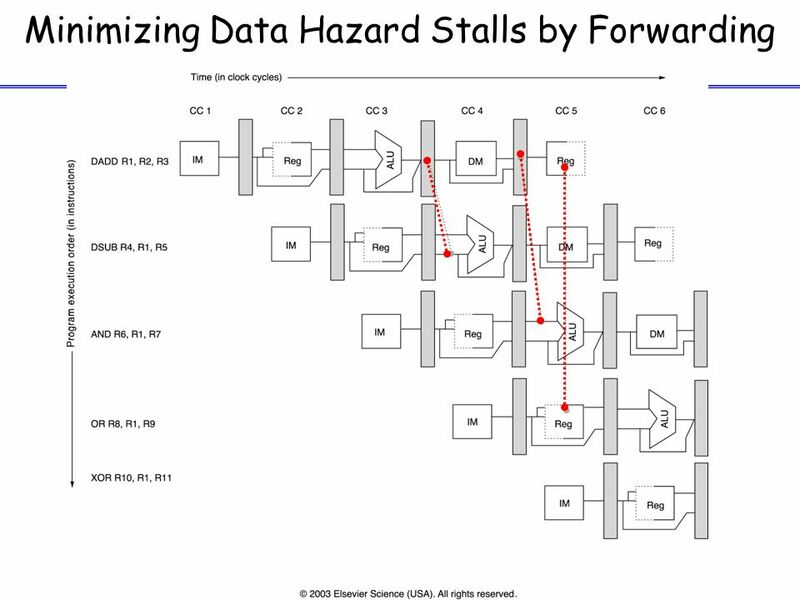 1 Pipelining Part 2 CS Data Hazards Data hazards occur when the pipeline changes the order of read/write accesses to operands that differs from. 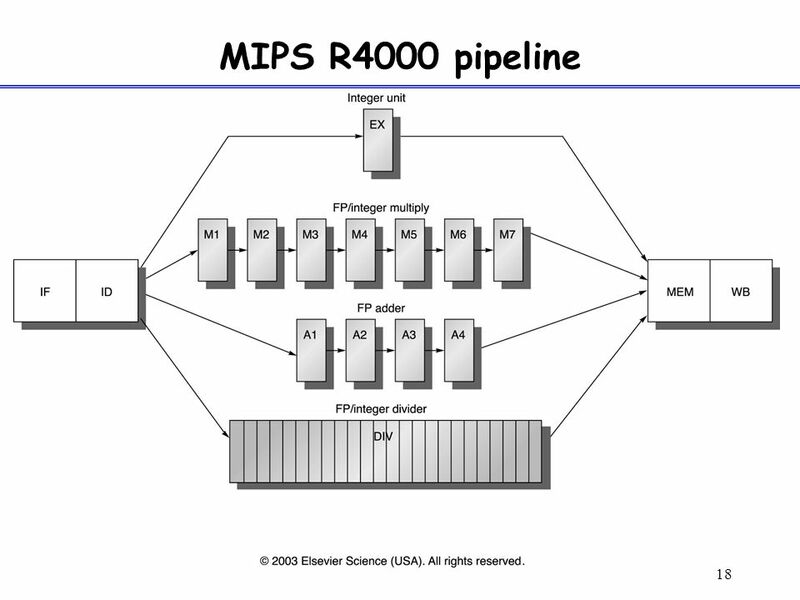 EECC551 - Shaaban #1 Fall 2003 lec# Pipelining and Exploiting Instruction-Level Parallelism (ILP) Pipelining increases performance by overlapping. EEL Advanced Pipelining and Instruction Level Parallelism Lotzi Bölöni. 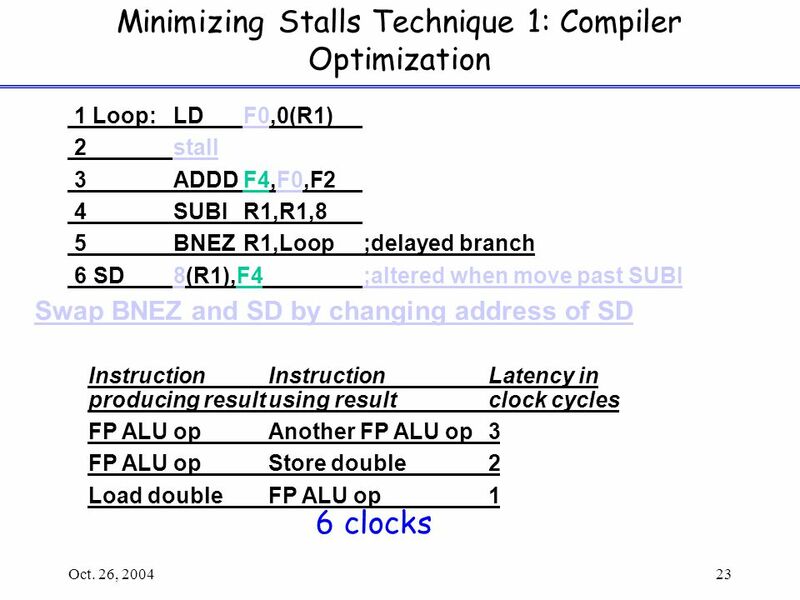 Computer Architecture Instruction Level Parallelism Dr. Esam Al-Qaralleh. 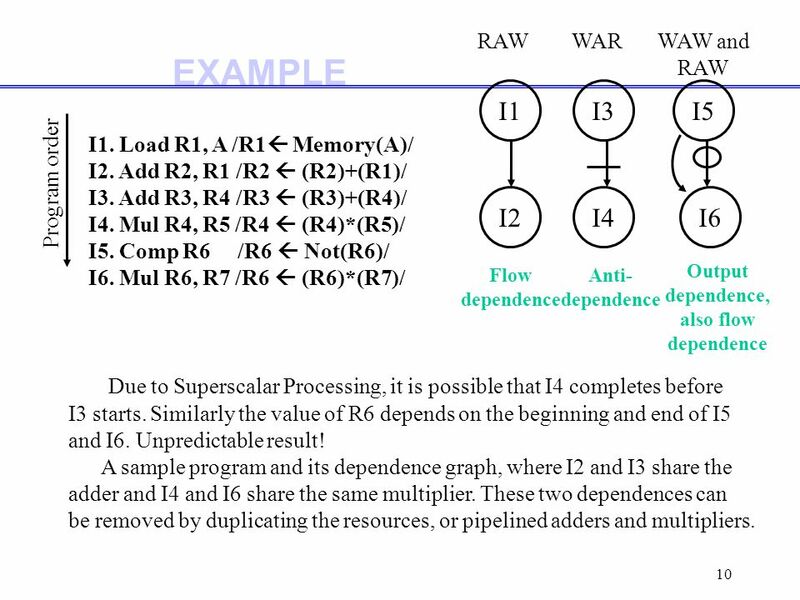 CS152 Lec15.1 Advanced Topics in Pipelining Loop Unrolling Super scalar and VLIW Dynamic scheduling.